Thanks to the efforts of UNESCO (United Nations Educational, Scientific and Cultural Organisation), the importance of Día de los Muertos was recognised in 2008, added to the organisation’s list of Intangible Cultural Heritage of Humanity. As a result, the festival –meaning ‘Day of the Dead’ in English – has seen increased global popularity, now acknowledged worldwide. Originated thousands of years ago with the Aztec, Toltec and other Nahua people, who considered mourning disrespectful, Day of the Dead is a celebration of life, held on 1st and 2nd November (All Saints’ Day and All Souls’ Day on the Catholic calendar). During the festival, traditional Mexican belief suggests the souls of the dead return to celebrate with their families each year. To celebrate, many Mexicans build ‘alters’ in their homes, embellished with photographs of deceased relatives and friends alongside their favourite foods, various trinkets and heirlooms. Candles, marigold flowers, sugar skulls and alcoholic beverages are also common alter features, plus water to quench thirst after the long journey back to Earth. During the celebration, many Mexicans also throw lavish parties, often toasting the dead with various drinks. Arguably Mexico’s most famous export, tequila seems a fitting potion to toast, perhaps from Patrón, one of the world’s most-recognised premium spirit brands. Although having become so globally renowned, all of Patrón’s tequilas are still produced at the distillery in the Highlands of Jalisco, Mexico. Having ripened for eight years, 100 per cent Blue Agave plants from the Highlands region of Jalisco (where the plants are bigger and have higher sugar content) are harvested for the production of all Patrón tequilas. These are then stripped using sharp Coa tools, revealing the ‘piña’ heart of the plant. The piña is then hand chopped and slowly steamed in traditional masonry ovens for 79 hours before being macerated with large, volcanic stone-milling wheels (‘Tahonas’). The resulting juice is fermented for a further three days and double distilled in copper pot stills. Literally meaning ‘old’, Añejo features a blend of aged tequilas, all of which have been matured in small white oak barrels for a minimum of 12 months. The spirit is finally decanted into a hand-blown bottle made using predominantly recycled glass, crafted by skilled glass artisans in Mexico, and sealed with sustainably sourced Portuguese corks. When poured, Patrón Añejo is clear and golden. On the nose, prominent aromas of vanilla, oak and honeycomb are joined by vegetal roasted pepper and courgette notes, earthy agave and sandalwood, with a back note of black pepper. The back note of black pepper continues on the palate when sipped neat, joined by a profound clean, grassy character with additional savors of cinnamon, gingerbread, more vanilla and a touch of melon and lemon rind. Lemon’s citrus character continues on the clean, smooth finish, complemented by prolonged spiciness of black pepper. Not unlike Patrón Reposado, yet cleaner, smoother and more pronounced: a brilliant, well-balanced example of aged Jalisco tequila. Inspired by ‘La Calavera Garbancera’, created by Mexican illustrator and cartoonist Jose Guadalupe Posado in 1913, ‘La Catrina’ was painted by Diego Rivera. Originally designed to mock the emerging upper classes in Mexico, as a reminder that everyone is equal in the end, Rivera’s painting takes inspiration from the original etching, famously painting it into a picture between himself and his wife, Frida Kahlo. ‘La Catrina’ has since become one of Mexican culture’s most iconic elements, with people dressing up and painting their faces to evoke skulls while celebrating. All ingredients to a shaker. Strain into a glass and garnish with the cinnamon stick. 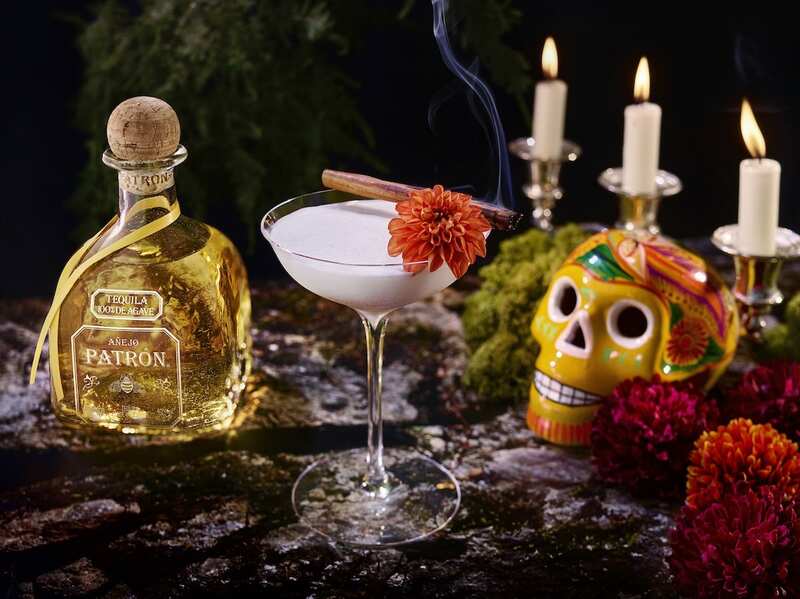 To celebrate Day of the Dead, Patrón Tequila will host Art of Patrón X Day of the Dead at the UNIT London in Mayfair on Friday 2nd November, 2018. Commemorating the Mexican celebration, the evening will play host to Day of the Dead inspired Patrón Tequila cocktails and master classes, live art installations, and make-up stations, alongside Latin music from a renowned DJ with Mexican heritage. Tickets are priced at £15, including entrance, three complimentary cocktails and an experimental masterclass, available from eventbrite.co.uk. Further information on Patrón can be found here.